Birgitt: Thank you, Alex, for coming to California last week for the Festival of Genomics. People at the conference were very inspired by your story and that you put yourself out there despite having Parkinson's disease. Alex: It was good being in San Francisco. Thanks again to our sponsors Thermo Fisher and the organizers of the meeting to make this happen. What are you up to? Birgitt: As I pointed out at the meeting, I am planning to write about your genetic make-up and potential factors that might predispose you to Parkinson's disease. 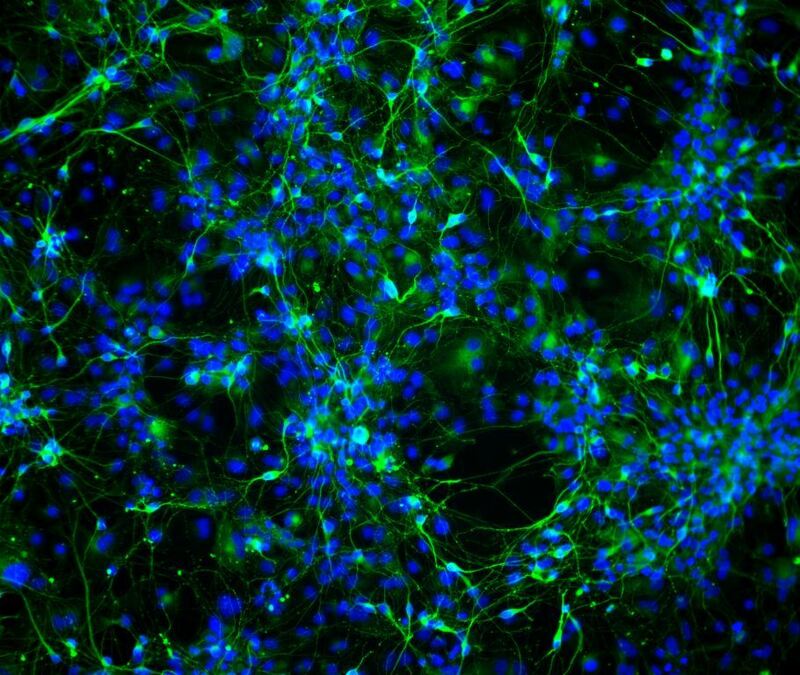 But today I will share with you how to make neurons from your skin-derived stem cells. Alex: Would it be possible to transplant these neurons back into my brain and replace the neurons that are gone? Birgitt: In principle, yes, that is an approach many research laboratories are working on. But to make cells safe for human use, they have to be handled under special good manufacturing practices, which means for example that cells cannot come in contact with any animal products. Your cells have been grown for research purposes only. Alex: Got it, makes sense. Birgitt: Here is a timeline that shows the neuronal differentiation from pluripotent stem cells over an intermediate stage of neural stem or progenitor cells, which take about 10-12 days and then 20-30 days for maturation into neurons. Alex: I am quite amazed that this is possible and the potential for drug discovery these cell cultures have. I really hope this will lead to faster discoveries and validation of novel compounds in the future. Birgitt: That is exactly the concept and idea behind developing these models. 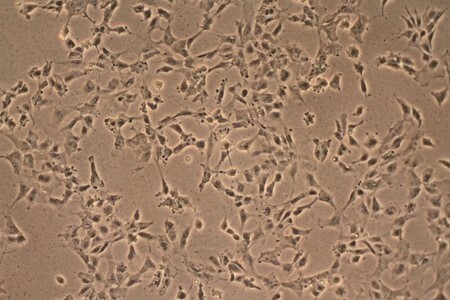 Here you can see how your neurons look after about 30 days differentiation. The blue dots are cell bodies and in green you see the processes of the neurons. Alex: Incredible and really beautiful. Are these really my neurons? I wonder what they are thinking about. Birgitt: I am sure they want cure for Parkinson's disease. Alex: And so do I! Alex: The Festival of Genomics in San Mateo/San Francisco is getting closer (http://www.festivalofgenomicscalifornia.com/). I am really looking forward to visit San Francisco and be on stage with you on November 5th, 2015 at 3p.m. at the San Mateo Event Center, CA discussing what really matters to conquer Parkinson's disease. Birgitt: I am excited as well. I am thankful to be invited by the organizers and that you received sponsorship from Thermo Fisher Scientific for your trip (https://www.thermofisher.com/us/en/home.html). Alex: BIG THANKS from me as well! The support is very much appreciated. Birgitt: We will meet you at the conference. We will talk about Parkinson's disease from Alex's perspective as a patient and my view as a scientist and how we can work together to make change happen for people with this disease. Alex: Let's hope El Niño hasn't started yet. See you in a couple of weeks. BTW: what is the attire for the meeting? California casual? 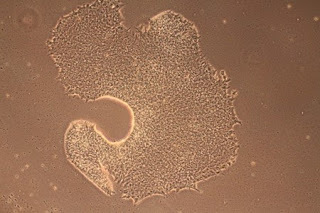 In the last post we discussed the potential for stem cells to be pluripotent, and which steps need to be taken to test for their pluripotency. In this post, we will explain to Alex how his pluripotent stem cells are transformed into neural stem cells. Alex: We should talk more often. It is very interesting to learn about the science and potential implications for new therapies. I am excited to learn about the transformation of my stem cells into nerve cells. Tell me, what are neural stem cells? Birgitt: Neural stem cells are the precursor cells of the brain. They can differentiate into multiple cell types such as nerve cells and cells that support neurons which are called glia cells. They are the stem cells of the central nervous system. Even in the adult brain, we can find neural stem cells. Recent studies have shown that physical exercise helps with the regeneration of neural stem cells. So, keep moving! Alex: I am running and keep moving, that's my motto. It helps a lot with my Parkinson's. What is the concept behind the transformation into neural stem cells? Birgitt: To understand cell differentiation one must understand the concept of the three germ layer. A germ layer is a group of cells that interacts with one another to create organs and tissues. Humans have three germ layers: the inner layer (endoderm), the middle layer (mesoderm), and the outer layer (ectoderm). Each one of these layers is responsible for creating different tissues of the human body. Nerve cells are derived from the outer layer. 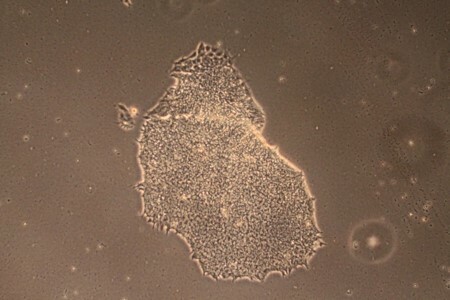 In the culture of your induced pluripotent stem cells, we promote the preferential growth of the outer layer cells and suppress the mesoderm and endoderm layers using specific small molecules and proteins in the cell culture media. Alex: Fascinating, there is indeed more than meets the eye in this process. Birgitt: Well, the process to transform stem cell into neurons or neural precursor cells has been a tedious and lengthy procedure in the past. However, newer protocols allow us to circumvent several difficulties, and has made the transformation much faster. 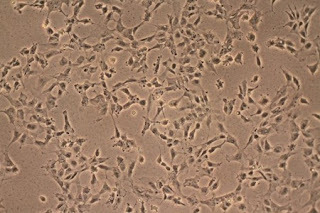 One procedure in particular has made it possible for pluripotent stem cells to be turned into neural stem cells in only seven to ten days. 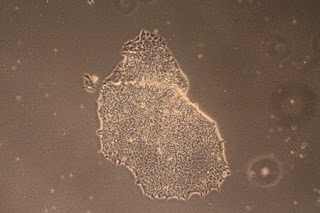 You can see your stem cells at day 2 and day 6 during the neural induction in the next two images. Alex: Interesting. 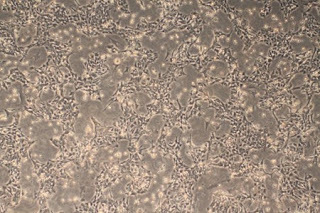 On the next two images below, my cells look completely different and I can see individual cells, almost like my skin cells. Birgitt: Exactly, after seven days and one enzymatic treatment to divide the cells, the cells grow in a single layer. 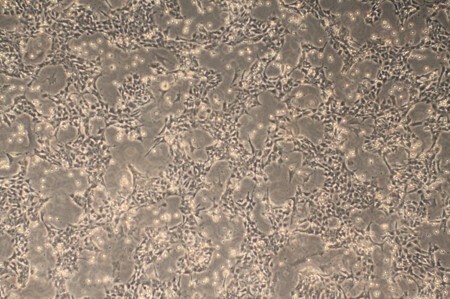 They look similar to skin cells, but have a rounder body and a few small processes. The images below are in two different magnifications, the first one is an overview and then a close-up. Looking good! Alex: And after that? These are not the dopaminergic neurons that are dying in my brain. I assume there is another step or steps? Birgitt: Right on, the neural stem cells can be further differentiated into different types of neurons or glia through several different processes. Many research labs develop protocols to make all kinds of different cells of the brain, such as cortical neurons, inhibitory GABAergic neurons, dopaminergic neurons, Purkinje cells, and motor neurons as well as glia cells like astrocytes or oligodendrocytes. The methods for differentiating all these types of neurons can require extended periods of time (up to several months). Alex: How long does it take to make dopaminergic neurons? Birgitt: It takes about 4-8 weeks to have fully mature dopaminergic neurons. A long way to go and it needs passion, endurance, and commitment, just as running a marathon. Will talk about them in the next blogs. Alex: Thanks so much, as always, fascinating and it gives me hope that this research will -some day, hopefully soon- change the lives of people with Parkinson's disease. Movie Monday Episode 5 "Alex Strikes Back"
In this week's video Alex discusses his future plans for raising awareness for Parkinson's. Movie Monday Episode 3 "Revenge of Alex"
In this week's video Alex discusses how he finds motivation to keep advocating for research for Parkinson's Disease. Movie Monday Episode 4 "A New Hope"
In this week's video Alex explains how he raises awareness for Parkinson's. Movie Monday Episode 2 "Stem Cell Wars"
In this week's video Alex discusses how Parkinson's has affected his professional and personal life. Alex was diagnosed with young onset sporadic Parkinson’s disease and has volunteered to let us use his cells for modeling Parkinson’s disease to better understand causes for neurodegeneration. In a dialogue with Alex, we will explain the journey of how his skin cells become a model for Parkinson's disease. More about Lauren, Birgitt Alex and our new co-editors.